Situated in the heart of the desert and nestled in the dunes of Dubai, Bab Al Shams Desert Resort & Spa is the ultimate luxury retreat.An exclusive low-rise resort in the desert surrounded by gently sloping dunes and natural desert landscape, Bab Al Shams offers guests a one of its kind traditional desert experience that is true to the culture and heritage of Dubai and the UAE.With its literal translation from Arabic meaning “gateway to the sun”, Bab Al Shams is built in an Arabic fort setting in and around an oasis. Inside the walls, shaded courtyards, walkways and water features provide cool shelter and maintain the unique ambience and atmosphere.Bab Al Shams Desert Resort & Spa is located in the heart of the desert, adjacent to Dubai International Endurance City, yet is just a 40-minute drive from the city of Dubai and only 45 minutes from Dubai International Airport.For those seeking a unique desert experience within easy reach of Dubai, Bab Al Shams Desert Resort & Spa presents the ideal destination. Offering the ultimate in comfort and entertainment, at Bab Al Shams Desert Resort & Spa your experience will be enhanced by history, splendor and magnificence. 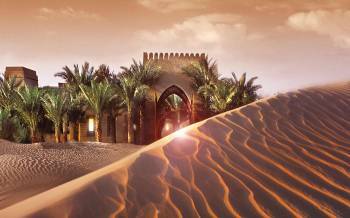 From versatile meeting rooms to exquisite restaurants, Bab Al Shams Desert Resort & Spa consistently combines rich Arabic culture and the latest in modern amenities. A choice of venues with flexible configurations, the latest in video-conferencing and audio visual equipment and a team of professionals who ensure prompt attention at all times, make the resort an ultimate retreat destination for corporate events.